Barely six months in operation, Paume's Pastry House is making its way in the food industry. Owner, Chef Carol, takes pride is offering traditional cakes and pastries from scratch with the finest, premium ingredients. This restaurant upgrades its menu to include meals for all members of the family to indulge in. Prior to discovering her passion for the culinary arts, the chef shares that she was passionate about visual arts. A fun nook in her shop reflects this creative side of hers. Kids would love to immerse themselves in a book or creative playtime at the said kiddie corner while the adults enjoy conversations over good food and coffee. When asked why she chose "Paume" for her business name, she explained that it is her French father's surname. In French, Paume refers to palm of the hand and since Chef Carol hand-crafts pastries, desserts and confections herself, she decided that Paume aptly describes what her culinary venture is all about. This is one of the best-tasting salads I've had. It was really good and a perfect way to start off a meal! I love the French ham and cheese sandwich. The Bechamel and the egg atop the croque makes it really impressive brunch. Croque Madame is great for kids, too. For a quick coffee fix, you may choose from Paume's Flavored Latte, Hand Brew, Classic and Signature Coffee Drinks. Their bestseller is the French Kiss Latte. 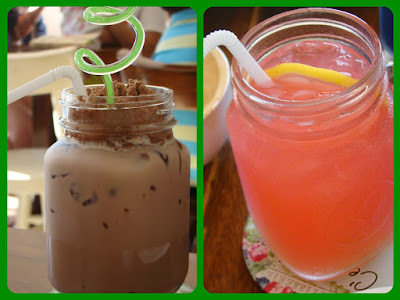 For kids, I recommend the Iced Milo Dinosaur (P 100) and the Mixed Berries Smoothie (P 150). My daughter loves these two drinks. I got to try the Mixed Berries out of curiosity (it comes in deep royal blue color which I find odd) and it really tasted awesome. Paume's Pastry House has a wide variety of confections which all looks great. Each cake portion was moist and good! My top two favorites were the Blueberry Cheesecake and the Hazelnut Nougat Cake. I will have to go and try their sugar-free Oatmeal Cookies next time. Pre-order your cakes and pastries from Paume's Pastry House. Chef Carol ensures that each one is carefully prepared to make it a perfectly fit for your special occasion. Ang cute nung latte. Been hearing lots of great stuff about Paume's kaso ang layo from mine. Hay! Food looks divine. But the dessert has my full attention. 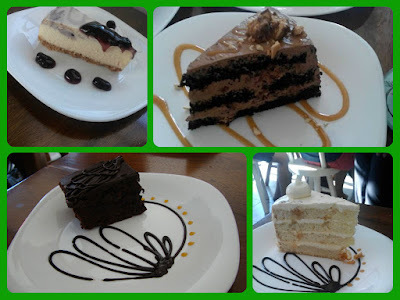 What could be more heavenly than coffee with those sinful desserts? Will definitely check out this place. Sayang ang layo ng Parañaque sa'min. But I think it's a great place and they have yummy food to serve. Ang cute omg! Sayang ang layo lang! The french Kiss latte looks super cute... Sayang other end ng lugar namin pero pag may chance we will visit the place.